Welcome to our Free Dreamweaver Tutorial section! Here you will learn some cool Dreamweaver tips, Dreamweaver Behaviors, CSS in Dreamweaver, Using Templates in Dreamweaver and more! 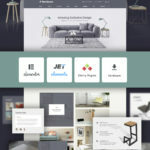 FancyBox is a tool that offers an elegant way to add zooming functionality for images, html content and multi-media on your webpages in a Mac-style “lightbox” that floats over the top of the web page. 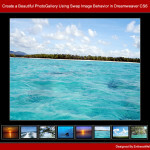 This tutorial is designed to help you create a Photo Gallery using Swap Image Behavior & Appear/Fade effects in Adobe Dreamweaver CS6. 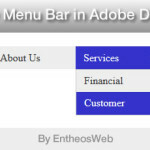 Learn how to create Spry Menu Bar in Adobe Dreamweaver.